The ultra-exotic diver's watch returns in new livery. 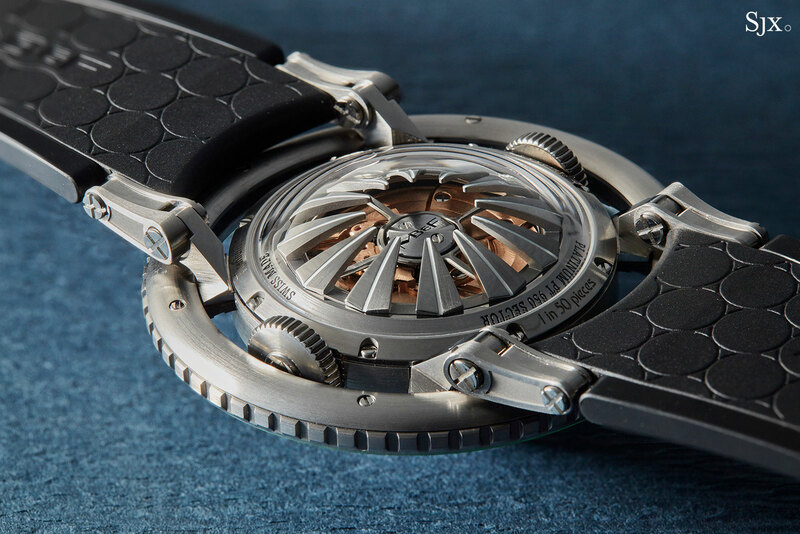 Part of MB&F‘s creatures-of-the-deep line (which includes an eight-legged clock), the Horological Machine 7 Aquapod was originally launched with in red gold or titanium, and fitted with a ceramic bezel. Now the HM7 is available in a new guise – titanium with a lime green sapphire bezel. To be precise the bezel isn’t actually sapphire, nor is it green. 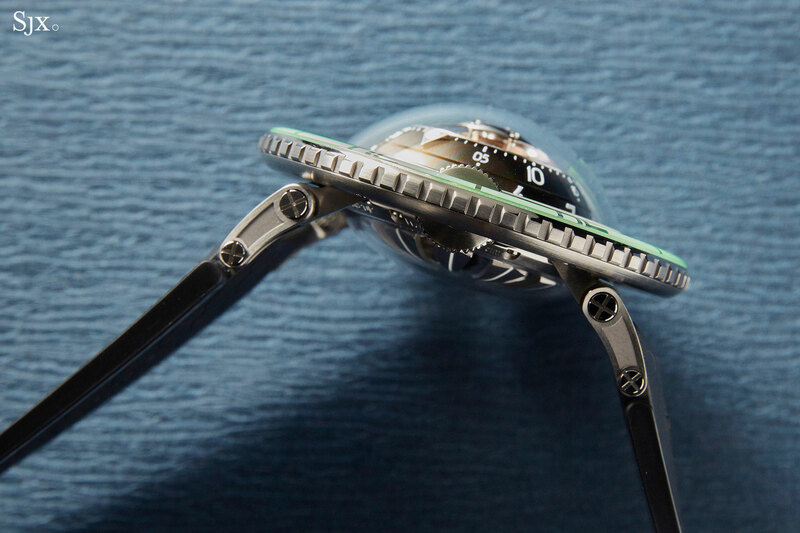 Rather, it’s a multi-part construction: the unidirectional rotating is made of titanium, with a clear sapphire crystal insert mounted on top. 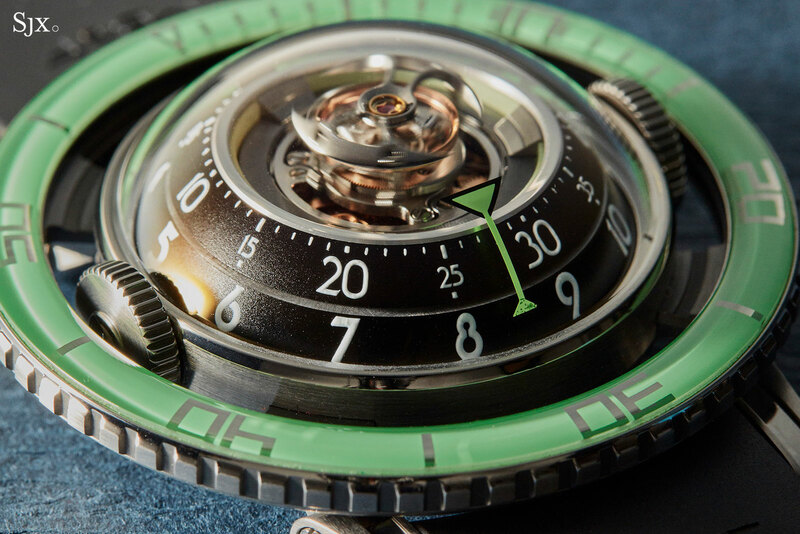 The underside of the bezel features markings and numerals in metallic deposition, plus a coat of opaque green lacquer, giving the bezel its bright green hue. 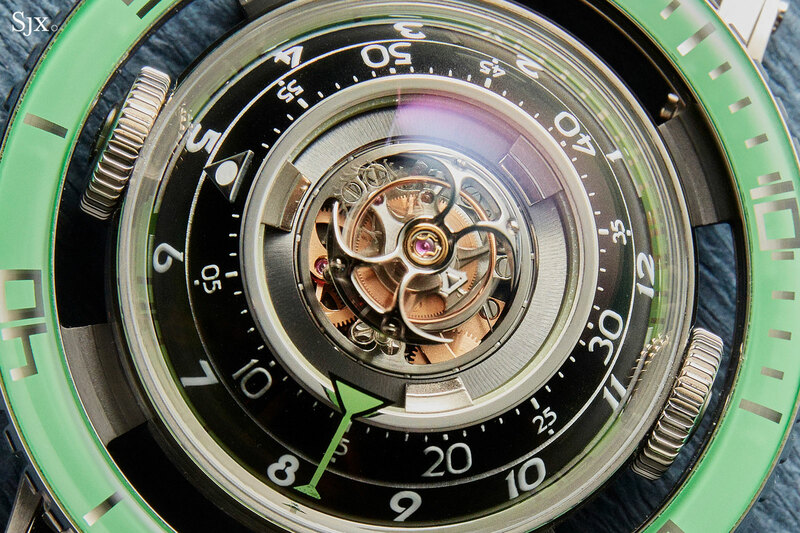 The green of the bezel matches the green glow of the Super-LumiNova on the dial and tourbillon. 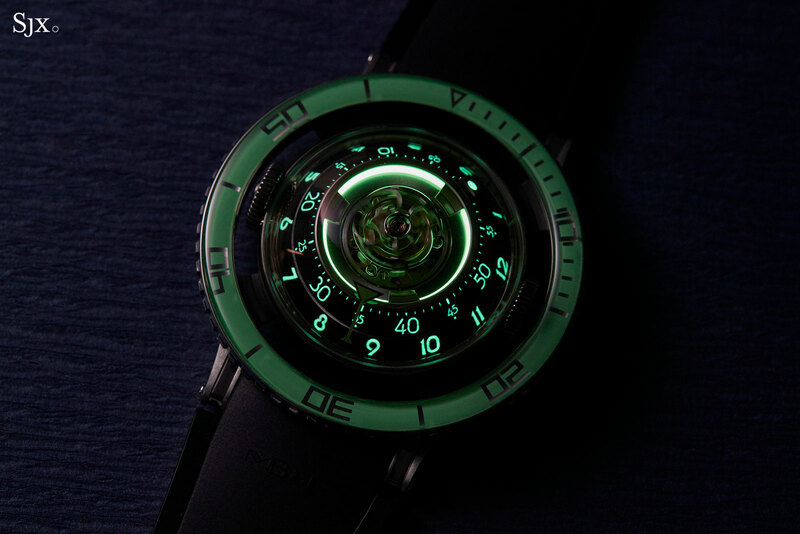 Like many of MB&F’s carefully conceived watches, the HM7 Aquapod looks as good in the dark as it does during the day. The rest of the watch is identical to the earlier HM7s. Inspired by the jellyfish, the bulbous case rises up in the middle, with the brand’s signature “battle axe” flying tourbillon sitting under a sapphire dome. 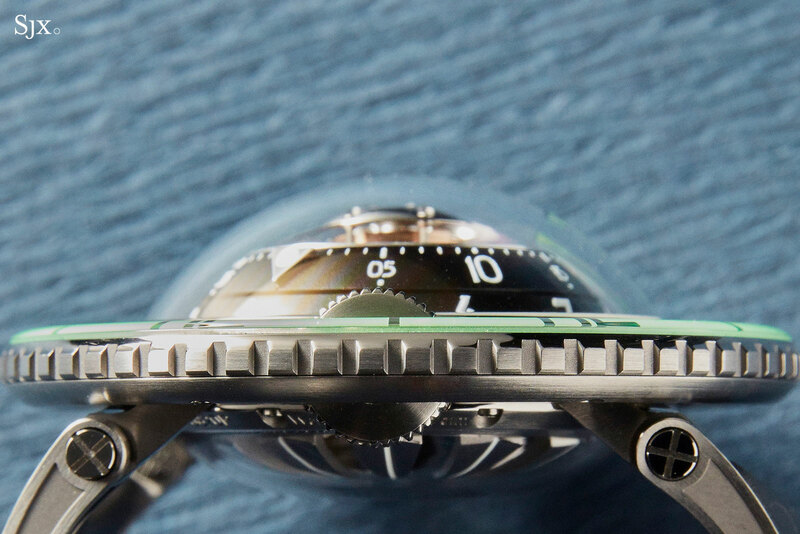 Time is shown on two rotating discs, via a green pointer printed on the underside of the sapphire crystal. The green bezel sits separate from the case, with the crowns in-between the two; the crown on the left is for winding, while that on the right sets the time. Though large at 53.8mm in diameter, the HM7 wears like a smaller watch as a consequence of its design, with the hinged lugs sitting underneath the case. It does, however, sit high on the wrist, measuring 21.3mm at its tallest. 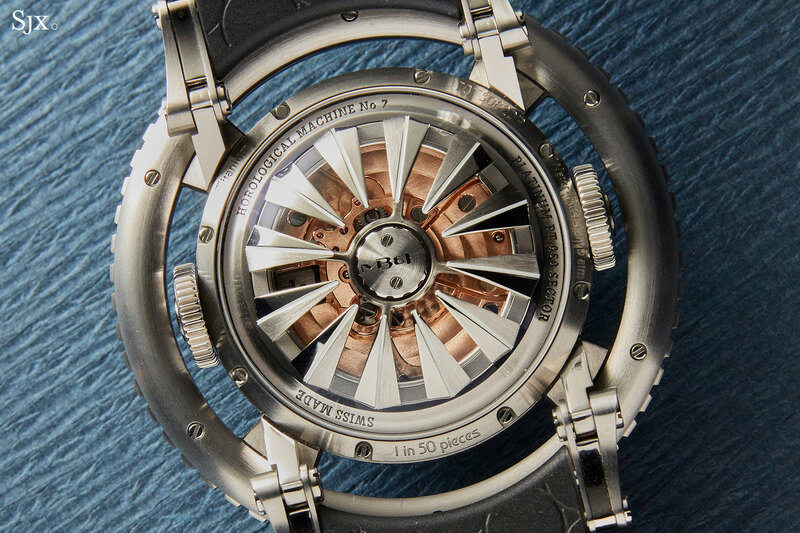 All that height is not just for show, for the movement is built almost vertically, with mechanics stacked upwards to culminate in the tourbillon. 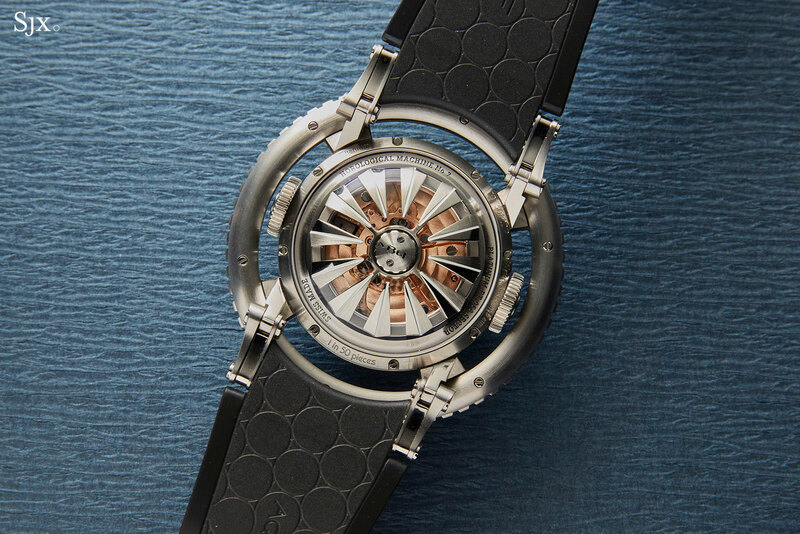 While most MB&F movements were developed by external specialists, this was conceived in-house. It runs for 72 hours on a full wind, and is made up of 303 components. It is automatic, and wound via a rotor set with spikes meant to evoke the tentacles of a jellyfish, though they more often evoke the asteroid-dwelling space slug of Star Wars (“This is no cave! ), a sci-fi reference Max Büsser would surely appreciate. 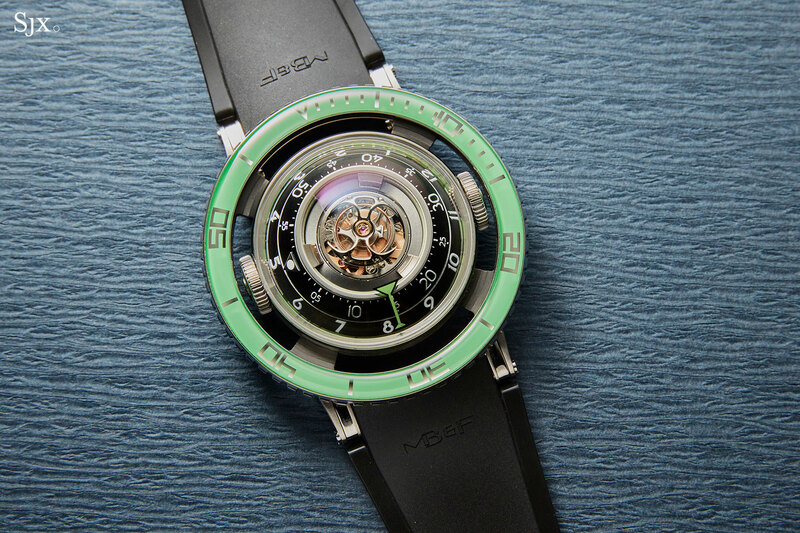 Limited to 50 pieces, the HM7 Aquapod in titanium and green is priced at US$108,000. Weird, oceanic, in-house and also surprisingly wearable.